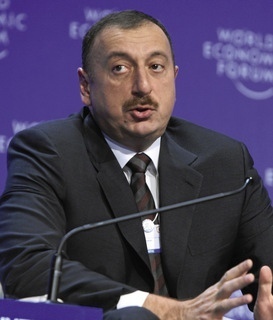 It comes as a surprise to no-one that the Aliyev dynasty will continue in Azerbaijan after the 9 October ‘election’ of Aliyev the Younger, who inherited the presidency mantle in 2003 from his father Heydar. The old man, known for building statues to himself, was an apparatchik from back in the Soviet days who transformed himself into an Azerbaijani nationalist in order to grab power from the ruins of the USSR. While Ilham purportedly gained nearly 85 per cent of the vote this time around, it’s really the support of the security forces and police that ensures the continuation of the dynasty. There were reportedly irregularities at over 50 per cent of the polling stations. Azerbaijan is a classic authoritarian petro-state where plentiful oil wealth ensures the loyalty of the corrupt élite that surrounds the Aliyev regime. But prosperity has spread beyond this, with per capita income rising from $900 in 2003 to nearly $8,000 this year. The resilience of the international energy market has buffered Aliyev’s despotism at a time when other regimes in the Caucasus and beyond are suffering from recurrent economic crises. Bar the odd wrist slap, Aliyev can count on international support from the West, desperate for Caspian Sea oil and gas, as well from his Russian and Asiatic neighbours who are none too concerned with democratic niceties anyway. For Ilham, elections may simply be a way of flexing his political muscle to keep potential opponents cowed and discouraged. It certainly seems to have worked this time.